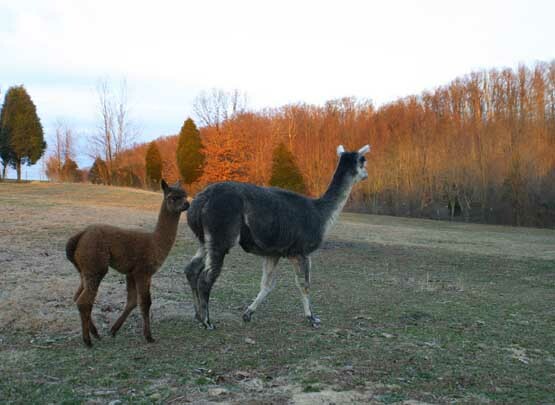 The first thing we tell everyone who asks about alpacas is to go and visit as many farms and ranches as possible. We cannot emphasize this enough. Every ranch is different and you will learn so much with each visit. Before you decide to get involved, you need to see what the options are. Talking to a lot of different people will get you the broadest picture of the alpaca industry and how it might best work for your situation. Once there, click on your state on the U.S. map. This will give you a list of all the farms in your state and, further down, a state map full of little brown alpacas, each indicating the location of a farm. Clicking on any alpaca will tell you the name and contact info for that farm. A really easy way to search for farms near you (regardless of what state they are in) is to just type your zip code into the search engine on the AOBA page and indicate the distance you are willing to travel in the "search radius" box. Then simply click on the "zip code radius" button to get a list of all the farms around you, including their exact mileage from your area. Note: Silver Thunder Alpacas designed the website for the TAA. Please check it out! Always working on link ideas for this page. So more link info coming soon. Farms we know in the East. Click here to return to the top of this page: Alpaca Friends.